I Prefer is the loyalty program for Preferred Hotels that is celebrating their 50th Anniversary and offering 50,000 bonus points for a two night or longer stay that is booked between January 29 – February 28, 2018. There is no stay date requirement (can be far out) and the points will be deposited to member’s account in April. 50,000 I Prefer points are worth $100 certificate. You can access this offer on I Prefer’s website here. Note that you must make the booking via I Prefer’s channels and the following two rate types are excluded; I Prefer Exclusive and Last Minute Escapes. The problem I have with I Prefer is that the number of points that you earn are essentially just 2% rebate of your stay. Why even bother at this ridiculously low level to have a program at all? You need to spend $5,000 to get $100 voucher. I would assume that most member points just expire unused. 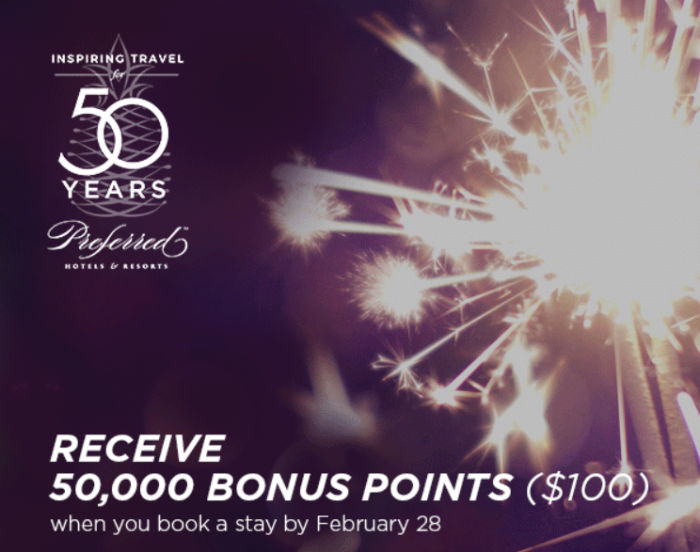 This 50,000 points offer can make sense for those that have been planning to stay at one of their hotels and could earn this one time bonus easily. Won’t sway my stay preferences, however. Must book stay between January 29, 2018, at 12:01 AM PST through February 28, 2018 at 11:59 PM PST. Booking must include active I Prefer℠ Member Number and be made through PreferredHotels.com, IPrefer.com, the I Prefer App, or Preferred Hotels & Resorts Global Reservations. Minimum 2-night stay required. Limited to points-eligible stays. No promotion code required and may be combined with other offers, except I Prefer Exclusive and Last Minute Escapes. 50,000 bonus points will be awarded to eligible member accounts in April 2018, but may be deducted if the qualifying stay is not completed. Each stay and each member account will be limited to a maximum of 50,000 bonus points under this promotion. Redemption and expiration of all I Prefer Points, including bonus points awarded through this promotion, are subject to I Prefer Terms & Conditions. Offer subject to restrictions and change without notice.